The DB2 which runs on the mainframes is basically a DB2 server; every server has an IP address and a port number which can be used to access the server. Note: A single IP address can have multiple ports. Each port will be for a particular service. For example port 80 will be a web server (for processing web page requests), while 21 will be for processing FTP requests and another port will be for DB2. All these services when provided from a single machine will have the same IP address but the ports will vary. Which port to connect to? So the first thing you need to know to connect to DB2 on mainframes is the IP and port to access. In mainframes get into the DB2 functions option (usually D;D); then go into DB2I (DB2 interactive) primary menu and then option 7 (DB2 commands) -> this is the panel for executing DB2 commands. In the DB2I defaults option (option D) give the DB2 name for which you want to get details -> a 4 character name. Then go to option 7 (DB2 commands). DB2 on mainframes refers to a Database Server Name as the "location name" (this will be four character name). You will now get the IP address and TCP port for this particular database. Now we know how to reach our DB2 server on mainframes using TCP/IP. DDF – Distributed Data Facility helps DB2 accept connections from outside the local system. Next step is connecting to this server. You need to have DB2 Connect on the machine that will access the mainframes. DB2 Connect is a product from IBM that enables easy access to DB2 on mainframes. It is not necessary that we need DB2 connect on every PC that connects to the mainframes DB2. Even one of the four clients available will suffice but these machines to connect to another PC having DB2 Connect. So one PC is used as a DB2 Connect Gateway – the DB2 Connect Enterprise edition permits this to be done. 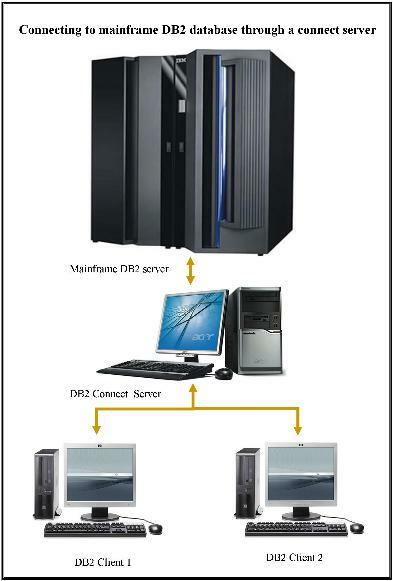 In this case all PCs connect to the computer in which Connect is installed and access the mainframes through that PC – kind of like a gateway to the mainframes DB2. DB2 Connect makes your company's host data directly available to your personal computer and LAN-based workstations. It connects desktop and palm-top applications to your company's mainframe and minicomputer host databases for access to your enterprise information no matter where it is. DB2 Connect provides the application enablement and robust, highly scalable communication infrastructure for connecting Web, Windows, UNIX, Linux and mobile applications to z/OS and AS/400 data. DB2 Connect is included in many of the DB2 products. Run-Time Client - provides basic, non-GUI access to DB2 databases. Administration client - used to remotely administer a DB2 server. The DB2 Administration client also contains all of the functionality available in the DB2 Run-Time client. Application Development client - Use this type of DB2 client to develop DB2 database applications, including stored procedures, user defined functions, and client applications. The DB2 Application Development client also contains all of the functionality available in the DB2 Run-Time client. What is the difference DB2 client and DB2 Connect? A database cannot be created on a DB2 client; you can only access databases that reside on DB2 servers. DB2 Client is free client for DB2 Linux, Unix, Windows. DB2 Connect is chargeable client (can be also server) and includes OS/400 and/or z/OS connectivity/license. So, you pay for only OS/400 or z/OS connectivity. Google for “DB2 Connect Download” and you will get the IBM link from where it can be downloaded; do read the licensing terms before using it. Once downloaded setup DB2 Connect and also install the .NET add-ons (present as part of the same setup package). Once this is done the IBM.Data.DB2 namespace will be available in Visual Studio .NET while developing applications. You need to import IBM.Data.DB2 in your .NET application. Everything in italics is dependent on your mainframe installation. The database name is the location name (the 4 character name). Server details is what we got through DISPLAY DDF command. After you’ve formed the connection string try opening the connection and closing it. If the connection is proper then you won’t get any run time errors. DB2 Connect also provides a Configuration Assistant (a GUI) using which you can test whether you are able to connect to the mainframes. From the start menu get into IBM DB2 and you will find Configuration Assistant. Here use the “Add database using wizard” option to add a database connection and test it. The process for using a gateway is the same as earlier except that for the server name in the connection string you would give the IP address of the machine having DB2 Connect. The port would be 50000 (default port used by DB2 Connect Server). 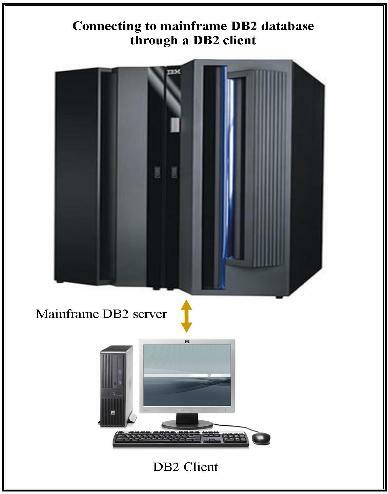 For the server: The PC which acts as the gateway should have DB2 Connect Server installed – and here we would establish a connection using Configuration Assistant to connect to the mainframe’s DB2. The name (alias) created for this connection is what should be specified in the connection string used by other PCs to connect to this server. The DB2 server should have been started – go through Administrative panel to the Services panel and start the DB2 related services. For the computers which connect to the server: The computer which connects to the Connect Server just needs to have the DB2 run time client installed in it (this is another IBM product but this is a very small product when compared to DB2 Connect). DB2 Connect is not required on these PCs since the gateway already has Connect installed. Server name and port should point to the PC with DB2 Connect and not to the mainframes DB2. netstat –a => displays all active TCP/IP connections as well as ports on which the computer is listening. Run this command on the PC connecting to the DB2 Connect Server and you will find it is listening on port 50000. Copyright © 2006 Sethu Subramanian All rights reserved. Sign my guestbook.